This almost tastes like custard it is so creamy and delicious. For me it is all about the balance between sweet and salty. I like to cook a little bit of sweet and salt into the oats while they are cooking so any adjustments in the bowl are only for fine tuning. Taste your oats after they are done- before you steam them to the finish so you can adjust for your liking prior to serving- the add ins are just that. 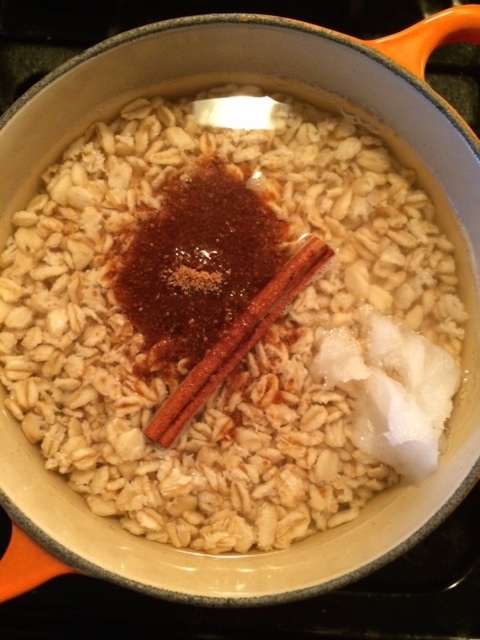 I also like adding the sweet into the cooking oatmeal because I find it’s a bummer when the add ins brings the temperature of the oatmeal down- I like my oatmeal hot! In a non reactive pot, add in the oats, salt, lemon juice and water and let stand overnight on the stove- no heat, just to soak or soak for at least 8 hours. The acid from the lemon helps to break down the phytic acid in the grain, making it easier to digest and absorb the nutrient content in the oats- this goes for all grains! You can cook in the soaking liquid. Soaking also substantially shortens cooking time for grains which is always a plus. Oats after soaking, ready to be cooked! More water as needed during cooking. Let this steam on the stovetop off heat for 5 minutes- taste this then let steam. After 5 minutes or so mix well and taste again. In an individual bowl, you may add whatever mix ins you love, I add more coconut oil, and maple syrup with a sprinkling of more cinnamon, maybe a pinch of salt. Nuts for added protein, walnuts and pecans are particularly delicious. 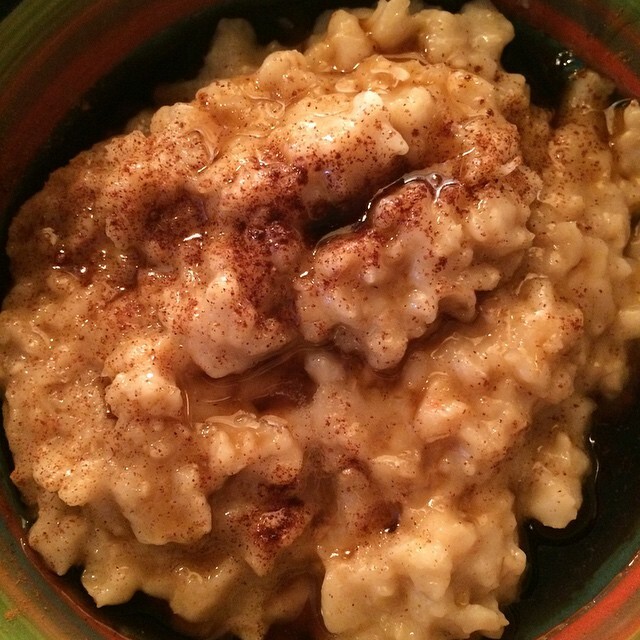 This entry was posted in breakfast foods, Grains and tagged carbs, comfort food, eat clean, oatmeal, sprouted. Bookmark the permalink. 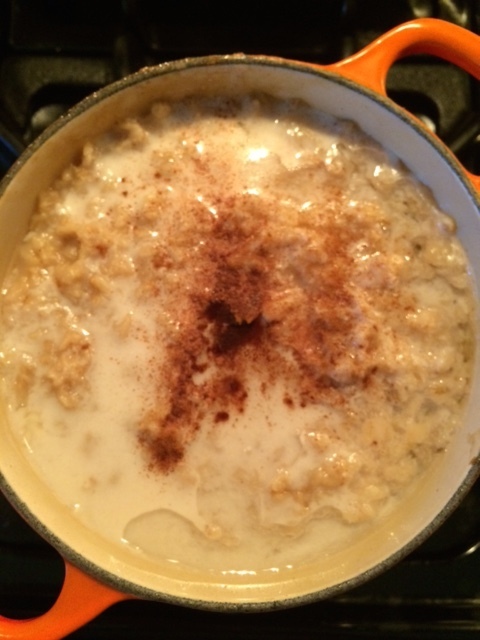 Just the best winter breakfast EVER…..